My Mom wrote this six years ago, after my Dad discovered their 90-year old neighbor was a war hero who fought at Iwo Jima. The story wound up in the Baltimore Sun. I’m posting it today because soon, all our WWII veterans will be gone, just like the man my mother honored six years ago. But also, because I know with certainty, that somewhere on this Memorial Day, someone over 90 years of age – someone who did something heroic at a time when our country was in dire need of heroes – is sitting alone with their memories. Memories of the friends they lost over there, once upon a time. Ten years ago my husband and I moved into a retirement condo and met our new neighbors. They were a nice, older couple — typical Baltimoreans with a passion for family, Maryland crabs, and The Orioles. I still remember the day John rushed in the door with news that would elevate Chick Serio’s status from that of ‘typical Baltimorean,’ to superhero. It was the beginning of a special relationship. Not just because my husband had been a history teacher or because he had served in the Korean War. John has a fascination with World War ll and an entire generation of heroes that is slipping away. Chick had rarely spoken of his military years, but now, at the age of ninety, agreed to share his experiences with us. The first thing we learned was that the term “hero” is reserved for the Marylanders who did not come home, or who returned disabled. During World War ll, that was more than 6,000 people. I was expecting to hear a story about a young man with lofty ideals of saving his country and preserving his family’s freedom. Instead, I heard about an innocent, unpretentious kid who had grown up with his own personal hero and best friend — his uncle Joe Marsiglia, just a year or two his senior. When Joe received his notice from the draft board in 1942, Chick, at the age of twenty, didn’t want to be left behind. With visions of fighting beside his buddy, he decided to enlist. His father, John Serio, had encouraged his son to join the Navy. “You’ll have a clean bed on a ship,” he said, “instead of sleeping in a filthy hole in the ground.” But when the two young men saw the long line for the Navy at the recruitment office, they opted for the Marines instead, figuring they needed men more than the Navy. Our friend reflected on boot camp at Parris Island where he was told, “A marine can do anything!” — and believed it. He talked about schooling and training at camp Lejeune, and in time, his promotion to sergeant. Then came the final intense training on the beaches of Hawaii where they practiced assault landings and had time to play some baseball. And then that long, unforgettable trip in the crowded, dark hold of a ship with the nauseating stench of body odor and vomit. It was on the deck of that very ship that Sgt. Serio would first hear the words, Iwo Jima, and learn of its strategic importance in the planned invasion of Japan. 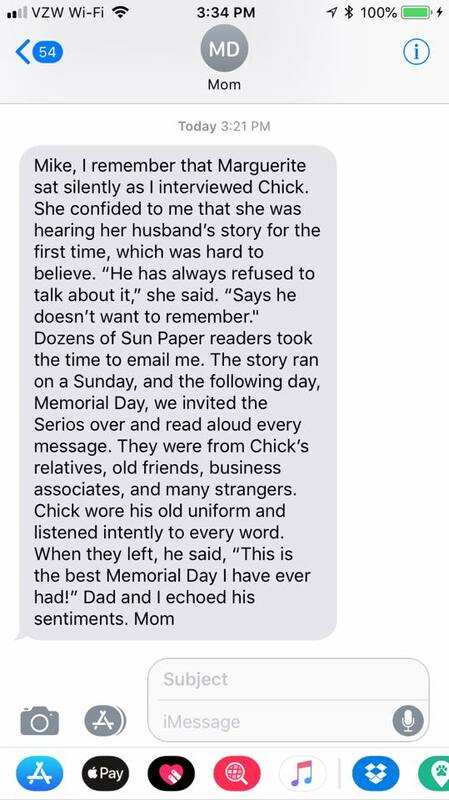 Occasionally, Chick speaks of his war experience in the present, as though it’s happening now, and it feels like I’m there with him. It’s February 19th, 1945, and we’re watching from the safety of our ship with horror as the first wave of Marines make their landing onto the island. American boys are flying through the air and falling to the sand as enemy mortars explode amongst them. When the boats reached land, the flaps were lowered, and the seasick Marines of the Fifth Pioneer Battalion, Fifth Marine Division joined men from other landing craft running onto the black volcanic sand, littered with debris and Marines – dead and alive. Chick still awakens from nightmares, sixty-seven years later, reliving the terror of life in a succession of foxholes: Japanese soldiers emerging from caves, running toward you screaming, brandishing guns and bayonets, ready to die; shooting blindly, and knowing that you’ve killed men – and feeling no remorse; a buddy standing up beside you and being shot dead; four days of intense fighting with no chance to even remove your boots or go to the latrine; using your helmet to soak your sore feet — and as a toilet. There were lulls in the fighting, quiet moments to reflect on a house in Walbrook and to ache for family. Time to remember the bustling produce stall at Lexington Market that had supported three generations of Serios. And his very first job at the age of eight, selling grocery bags to shoppers. Time to remember Mt. 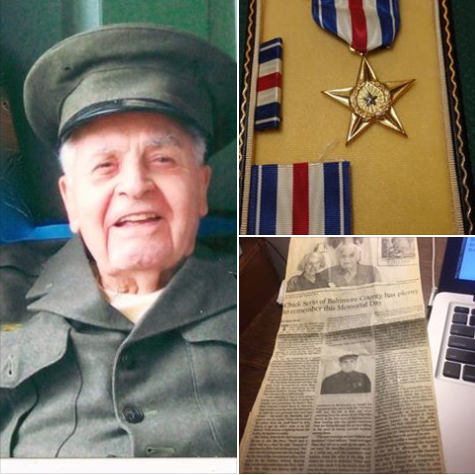 St. Joe High School and his Italian father’s advice about enlisting – and knowing that he had been right. But most of all, moments to mourn his Uncle Joe, whom he had not seen since basic, and who lay critically wounded in a hospital. Then came that fateful day on March 26th when his unit was under fierce attack and running out of ammunition. Chick commandeered a jeep and drove through enemy fire to the ammo dump on the beach – shooting four enemy soldiers along the way. At the dump, a sergeant and the major in command refused his request. In desperation, Chick leveled his rifle at their heads and said that men were dying as they spoke. The major and sergeant backed down, and Chick’s men loaded the jeep with ammunition. As a result of his actions that day, a U.S. assault team was able to successfully counter the Japanese attack. Sgt. Charles A. Serio would receive the Silver Star for valor in recognition of his resourcefulness in the closing battle for Iwo Jima. Back home, Chick earned a law degree from the University of Baltimore and eventually formed the Charles A. Serio Insurance Agency. He and his wife, Marguerite, had four children. Uncle Joe survived his serious injuries and returned home to a full life, despite being disfigured by enemy fire that took part of his jaw. Chick Serio credits a strong faith in the lord for bringing him through the turmoil of war and its aftermath. He feels fortunate to have lived to see the National World War II Memorial in Washington, D.C., and to witness the resurgence of interest in all things World War II, with movies and best-selling books. We are ever grateful to our neighbor, Chick Serio, and to his generation of Americans who fought the good fight.